Winnie The Pooh's Giant Lift the-Flap Board Book Just $6.64 Down From $10! You are here: Home / Great Deals / Amazon Deals / Winnie The Pooh’s Giant Lift the-Flap Board Book Just $6.64 Down From $10! Winnie The Pooh’s Giant Lift the-Flap Board Book Just $6.64 Down From $10! 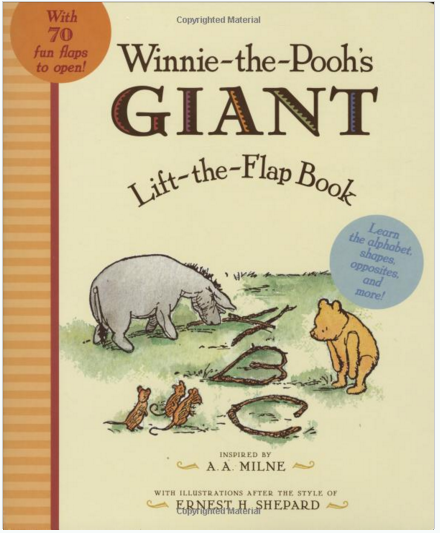 Head over to Amazon and score this deal on Winnie The Pooh’s Giant Lift the-Flap Board Book for just $6.64 down from $10! Get yours now while it lasts! Winnie-the-Pooh leads the way in this adventure of shapes, colors, numbers, letters, and how to tell time while exploring his oversize lift-the-flap book. Each page is packed with surprises hidden under 70 fun flaps. There is an alphabet’s worth of presents to open and a clock that tells what Pooh does at each hour of the day. There is even a Hundred Acre Wood game of hide-and-seek to play. This is a primer to learning fun that children will want to join again and again!